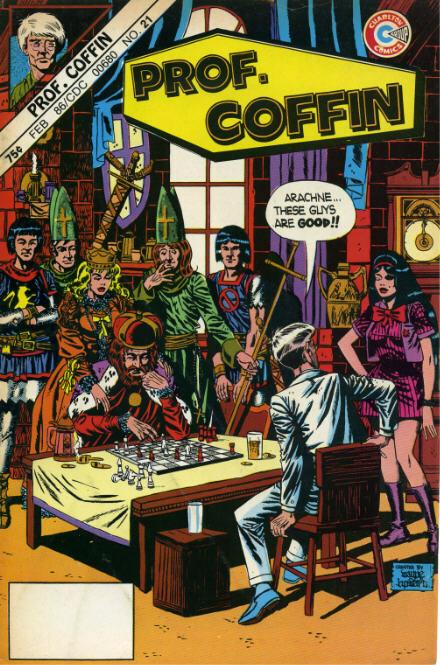 Charlton Comics’ Professor Coffin 21 had a cover date of February 1986.Typical of Charlton’s strange numbering system it was only the third issue of the title. I’m sure it only contained reprints although they didn’t admit to it. They even seem to have lost the bar code !! This must be one of the last..if not THE last comic Charlton ever issued. Unless YOU know otherwise? Thanks for filling in the details. I have umpteen Charlton comics but seem to be missing Midnight Tales No3. The GCD is a fascinating place to visit. It is organised and informative wheras this blog consists of me literally closing my eyes and randomly pulling something out of a box.Talking of covers being used again…I’ve just realised Warren’s Vampirella No111 has the same cover as Seaboard’s Devilina No1 and that picture has been reversed too. How odd is that!